This cleansing conditioner is so amazing for curly girls, frizzy hair, humidity control and damage - basically anyone lacking natural moisture. 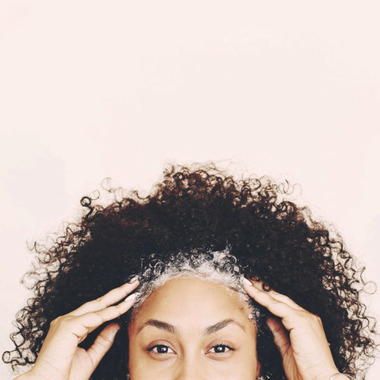 When worked through, FRIZZ MANAGEMENT gets hair clean while natural oils remain intact to moisturize and restore. 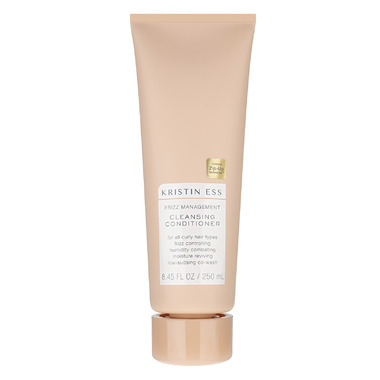 Kristin Ess' proprietary strengthening complex designed to "zip-up" split ends while targeting weak areas of the hair, smoothing the appearance of damaged cuticles and helping to protect hair from environmental stressors and color fade. Cleansing conditioners are a great way to keep your natural oils intact while rinsing away the excess. 1. Divide your hair into four sections - two in the front and two in the back. 2. Apply a nickel-sized amount of cleanser to wet hair at the root of each section. 3. Gently work into hair, focusing on the root area, for one minute per section. 4. Rinse hair thoroughly. The middle and ends will get as much cleansing and conditioning as they need as the product rinses through. Tip: It takes a second to get used to low-sudsing cleansers, but it's worth the transition! Ingredients: Water, Cetyl Alcohol, Glycerin, Isopropyl Palmitate, Cyclopentasiloxane, Behentrimonium Chloride, Fragrance, Acacia Concinna Fruit Extract, Algin, Aminomethyl Propanol, Balanites Aegyptiaca Fruit Extract, C12-13 Pareth-23, C12-13 Pareth-3, Caprylic/Capric Triglyceride, Carrageenan, Cetearamidoethyldiethonium Succinoyl Hydrolyzed Pea Protein, Cetrimonium Chloride, Chitosan, Coco-Glucoside, Disodium EDTA, Divinyldimethicone/Dimethicone Copolymer, Gelidiella Acerosa Extract, Gypsophila Paniculata Root Extract, Hydrolyzed Keratin, Hydroxypropyltrimonium Hydrolyzed Corn Starch, Hydrolyzed Corn Starch, Hypnea Musciformis Extract, Keratin, Laureth-4, Litchi Chinensis Pericarp Extract, Panthenol, Polyquaternium-7, Propylene Glycol, Quillaja Saponaria Bark Extract, Retinyl Palmitate, Salvia Hispanica Seed Oil, Sargassum Filipendula Extract, Sorbitol, Xanthan Gum, Methylchloroisothiazolinone, Methylisothiazolinone. Most shampoos you need to repeat the process twice, with this, I use 1 tiny application and it makes my hair feel amazing. I still need to use a conditioner with it, but so much less then what I would normally use. Very easy to use - makes my hair feel SOOOO soft - and all in one easy clean and condition step! Love it!